You probably haven't heard of Joseph Stiglitz. He was a professor at Yale, Oxford, and MIT, he was on President Clinton's council of economic advisors, was the chief economist for the World Bank, and now teaches at Columbia. Oh, and he also won a Nobel Prize in Economic Sciences. No smaller a figure than he has weighed in on the state of our economy and what he thinks can get us out of it in an interview with the AP. Q: Economic growth is slowing again. Unemployment seems to be stuck above 8 percent. Is that the result of high debts or slower spending? A: The fundamental problem is not government debt. Over the past few years, the budget deficit has been caused by low growth. If we focus on growth, then we get growth, and our deficit will go down. If we just focus on the deficit, we're not going to get anywhere. This deficit fetishism is killing our economy. And you know what? This is linked to inequality. If we go into austerity, that will lead to higher unemployment and will increase inequality. Wages go down, aggregate demand goes down, wealth goes down. All the homeowners who are underwater, they can't consume. We gave money to bail out the banking system, but we didn't give money to the people who were underwater on their mortgages. They can't spend. That's what's driving us down. It's household spending. Be sure to read the rest of the interview. 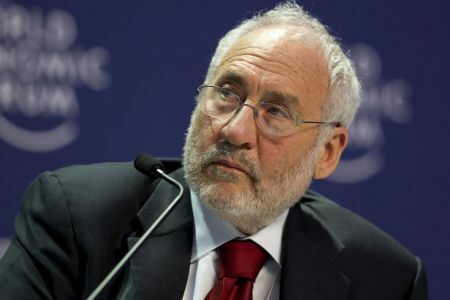 Stiglitz's main point is that we have too much economic inequality in our country. He has a thoughtful and interesting take and it's one that resonantes with me. I've been calling for us to move away from austerity, which many conservatives are calling for though it's clearly not working in Europe, and to move toward spending. We need major national investment in infrastructure and education now more than ever. As such, I was also struck by his words on student loans as "evil and oppressive." Q: What's the answer, then? Raising taxes on wealthy people can't possibly solve all the problems you mention. A: No, there's no magic bullet. But there are other ways of doing things. Just to pick one, look at how we finance higher education. Right now, we have this predatory lending system by our banks with no relief from bankruptcy. In some fundamental ways, it's really evil and oppressive. Parents that co-sign student loans now find out they can't discharge those loans, even in bankruptcy. Education is so important, but there are so many barriers. Just 8 percent of those students in the most selective colleges come from the bottom half of the income scale. Eight percent! They can't get in because they don't get as good an education in elementary and high schools. Education is the vehicle for social mobility. It's how we restore the American dream. It's hard to put into words how much I agree with Stiglitz on this. Investing in education seems to be a no-brainer to me, for conservatives, moderates, progressives, and liberals alike. Investing in education offers a great return on investment and helps our country's competitiveness in a global economy. Conservatives should love this because it means losing less jobs to countries like India and China. Investing in education also helps to break the cycle of poverty and give many more people a realistic opportunity at upward social mobility. As I said, a n0-brainer.